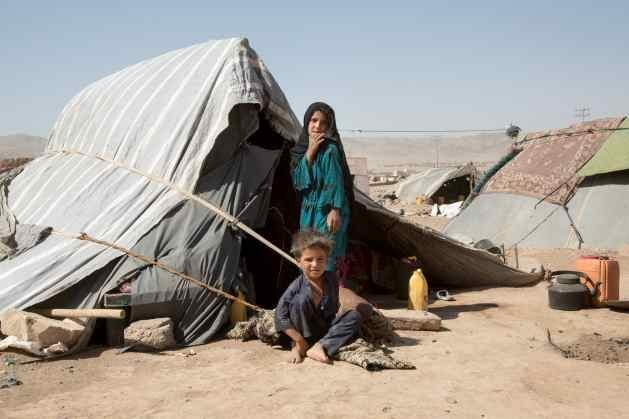 Drought-affected IDP children from Badghis in front of their makeshift shelter in Kahdestan area or Injil district. Credit: NRC/Enayatullah Azad. HERAT, Afghanistan, Aug 30 2018 (IPS) - Amid a precarious security situation in Afghanistan, the worst drought in recent history, that hit two out of three provinces in Afghanistan in July, has destabilized the lives of tens of thousands of civilians, some of whom have already been displaced. The United Nations has predicted that over two million people are expected to become severely food insecure in the coming period. The West Region of conflict-stricken Afghanistan has been hardest hit by the drought, and over 60,000 people have been displaced to Herat and Badghis provinces, as a result. Families that fled to Herat are living in dire conditions in makeshift shelters, where they are exposed to the scorching sun and summer temperatures of over 40 degrees Celsius. Many families are subsisting on a single meal a day. Many get by on just bread and water. Herat has become the closest refuge for about 60,000 people, who have been displaced from their homes due to the drought. Conflict has also prompted many to flee their homes to the relative safety of province. Over 1700 civilians were killed in Afghanistan during the first half of 2018, according to UNAMA. It is the highest recorded number, compared to the same periods for the past decade. The combination of drought and conflict has made tens of thousands of families destitute. They live with few long term prospects or means of regaining stability. 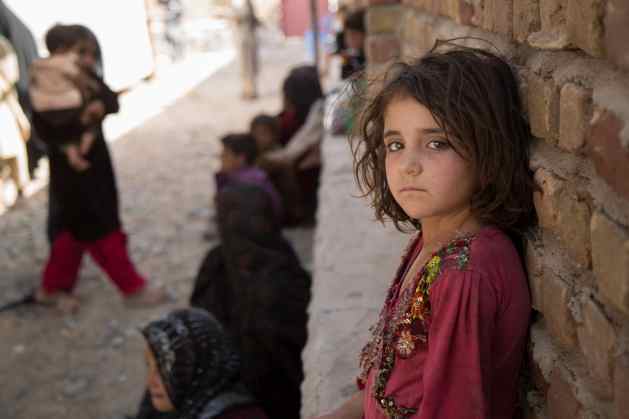 Ayesha Halima is one of thousands of such children, who fled her home for Herat. Leaning against the wall of a distribution center, she patiently awaits her next meal, as he mother moves through the growing crowd to get their rationed supplies. Halima at the NRC’s cash for food distribution center in Herat. The lack of sufficient nutrition is visible in the pallid faces of children like Soraya Hawa Gul and FatimaPari Gul, who have become neighbors in Herat. They bake bread together in a clay oven in the open air. The mothers make about ten loaves of bread a day, which they wash down with boiled water or tea. Given such meagre resources, the unconditional cash grants from ECHO and NRC have become life lines for tens of thousands of the impoverished households. Despite the rapidly deployed assistance, drinking water, food and medical supplies are falling short. The blazing temperatures are testing the endurance of those who are in the IDP settlements. Many people are suffering from dehydration, with children and older IDPs particularly susceptible. With few water resources around, drinking water is a prized commodity in the settlements. With illnesses such as diarrhea, skin diseases and eye infections on the rise, many children are in need of comprehensive medical care. One-year-old Ahmad Mohammed has diarrhea, and a skin and eye infection. He lives in a makeshift shelter with his family after they were forced to leave their home in Badghis city/region/province. “It’s been 70 nights since we arrived. My children and my wife are all sick, and I don’t have the money to buy them enough food or medicine,” Mohammed’s father Ziauddin told NRC. 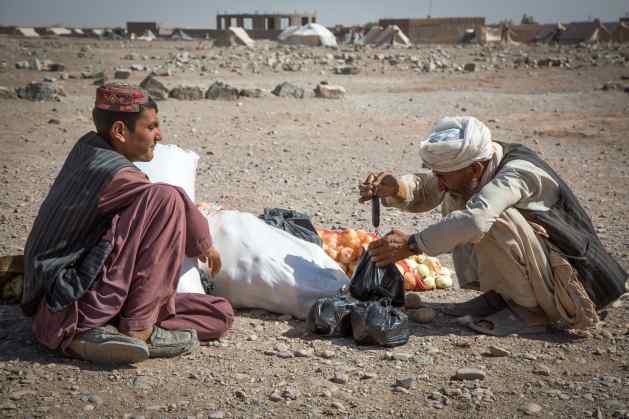 Karim selling onions and potatoes near his tent in Kahdestan. Credit: : NRC/Enayatullah Azad. For thousands of families displaced from Herat the few items they carried on their backs are the only remnants of their homes. For many, this is not the first instance of leaving their homes and belongings because of drought. While news of peace talks and bombings in Afghanistan make the headlines, the IDP communities suffering chronic, long term displacement feel “forgotten” by their government and the international community. They are in desperate need of long term assistance.